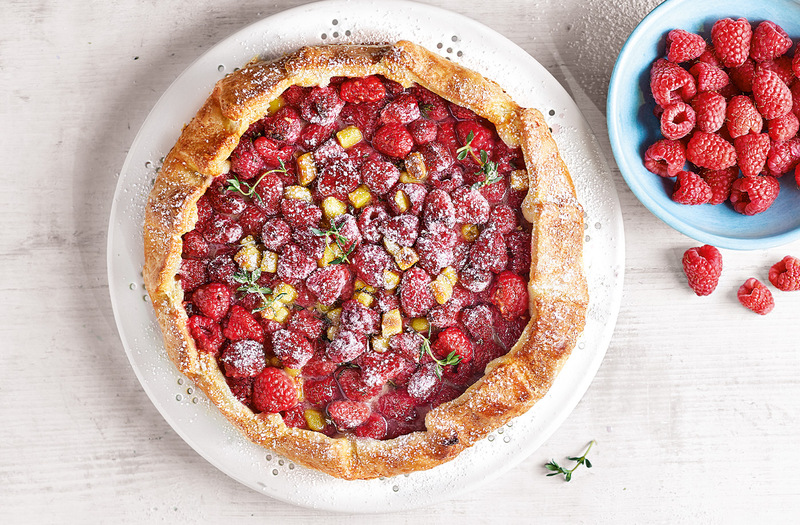 This simple raspberry galette recipe is the perfect summer dessert. A galette is an easy French free-form tart, with crisp pastry encasing jammy baked raspberries and melting chunks of golden marzipan. Preheat the oven to gas 6, 200°C, fan 180°C. Roll out the pastry on a lightly floured surface to the thickness of a pound coin, then cut out a 30cm circle using a dinner plate as a guide, saving the offcuts for another recipe. Transfer to a large baking sheet lined with baking paper. Mix the raspberries with the thyme leaves, 3 tbsp caster sugar, the cornflour and marzipan. Sprinkle the pastry with the ground almonds and spoon the fruit mix into the centre, leaving a 7cm border. Fold the pastry border up and over the fruit, overlapping where needed, and pinching to seal any cracks. Brush the pastry edges with beaten egg and sprinkle with the remaining caster sugar. Bake for 35 mins until the pastry is golden and crisp. Leave to cool for a few mins, then dust with icing sugar and the thyme sprigs. Serve with ice cream, if you like. Tip: The ground almonds help absorb the juices from the raspberries to keep the pastry crisp.